Motorhome & Campervan Hire Trips – How far should you go? The maps are out, the tourist board info is spread all over the kitchen table and you start to imagine yourselves in all of the beautiful places in the photos. France and Europe look small and very “do-able” from your kitchen table, but how much should you really try and see in the amount of time you have? There is a great deal to see in France but how much should you fit in to your motorhome trip? Based on copious feedback from clients and our own experience, we think it’s all too easy to bite off more than you can chew and less is definitely more in a European campervan trip when it comes to deciding what distance travel. Setting a route which aims to cover many kilometres very often achieves little more than an exhausting and expensive trip. With ever changing scenery and historical treasures every few kilometres, the best experiences are to be found much closer together than you might think. So how do you get the best from your trip, without exhausting the driver, falling out with your travelling companions or spending a fortune? Here we give you our top 12 tips for creating an itinerary that is achievable and enjoyable. Your holiday is precious and you should spend it doing things you enjoy. 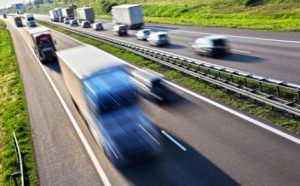 We have not yet met anyone who enjoys driving on the dull, fast “Autoroutes” (toll paying motorways) so the less of your trip you spend on them the better. Ask yourself if you would prefer to spend your days discovering a medieval village, visiting the farmer’s market, people watching from a café terrace, driving through idyllic countryside, exploring a chateau and taking time to find somewhere great to stay or would you prefer sitting on the autoroutes for most of each day and hurriedly choosing where to stay as it gets dark? Of course, you could opt for a balance between the two but the point is, you don’t have to waste any of your holiday doing the one thing that nobody enjoys so it’s best to plan a trip that does not require long drives on the most boring of roads each day. In fact, if you can avoid big drives altogether you will see a great deal more and enjoy much more of your trip. 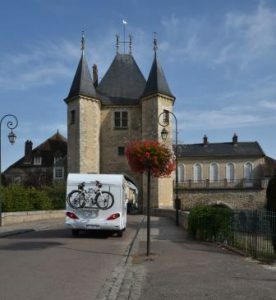 When it comes to motorhome travel, France is the jewel in the European crown so unless you are taking a very long trip, aiming to visit other countries is rather missing the point of hiring here. France is the world’s favourite tourist destination for good reason and also has by far the best facilities for motorhomes too. The sheer density and diversity of great things to see combined with the fabulous road network and vast choice of places stay overnight make this the best destination in Europe for a campervan trip so why plan to visit other countries until you have really explored France? 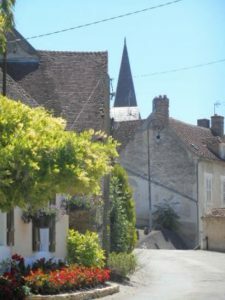 For those who are not familiar with France, it frequently comes as a pleasant surprise that there are great sights to see at virtually every turn of the corner if you stay off the autoroutes. Don’t just head for the places you have heard of as they will inevitably be spread out all over France or Europe. Every region of France has its own unique style and highlights so don’t think you have to go to another country to see contrast, it’s all around you right here. Our two neighbouring regions of The Loire Valley and Burgundy are classic examples. Both are literally peppered with chateaux, ancient abbeys and cathedrals, vineyards, rivers and canals, pretty villages, lively towns, big cities and outstanding natural beauty wherever you look. Why would you pick up a motorhome here then spend a big chunk of your trip heading to another country and back and miss out on all of that? Just because you can get there, does not mean you should! 3. What is the one piece of advice that first time clients always want us to share with others after their trip? We hear these heartfelt pleas literally hundreds of times each year when clients return from their first French or European trip. “You must advise newcomers not to do what we did, we wanted to fit in as much as possible but finished up driving much too much. We had no idea that there was so much to see here and wish we had concentrated on a smaller area so we could see more of it”. A more relaxed schedule allows greater flexibility. According to many of our clients, even though they had set a specific schedule, they found themselves changing their plans so that they could stay a few extra days in a region because it turned out to be too beautiful to leave. Perhaps it is better to set an easier schedule in the first place so that if you do discover a town or region you love, you can stay there long enough to enjoy it without rethinking your trip. Covering big distances increases cost with very little benefit. We suggest you use the autoroutes as little as possible. Toll fees to use the autoroutes here are high and you don’t see anything of France thrashing along them at speed. For every autoroute you can choose a free alternative which will make for a much more enjoyable drive. Needless to say you won’t make the same progress but as you don’t have to travel far each day to see something new, you will enjoy the driving as well as the destinations. 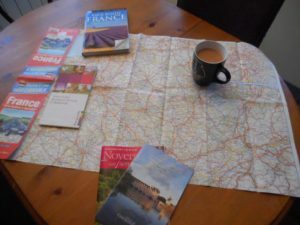 When planning motorhome trips, bizarrely, many people decide to cover bigger distances than they would if they were travelling in a car which does not make any sense at all! Travelling in a motorhome is not like travelling in a car. You will be driving a much larger vehicle on unfamiliar roads where all the signage is in a foreign language so you have to drive at a much slower pace than you would at home in your car. You also need to take the time to check your route is suitable for a motorhome, stow everything before you for travel, settle campsite bills, empty waste tanks, fill up water tanks, shop for supplies, find the places you want to visit and find nice places to stay. It’s not that the tasks themselves take time, more that you are doing them for the first time and in a country where you don’t speak the language. It can take a while to shop for food when none of the brands or words are familiar. Fruit and vegetables are easy to recognise but making sure you buy beef instead of horse steaks (!) takes a bit of double checking as does determining the difference between a packet of salt and granulated sugar. The produce on offer in France is incredible and visiting a supermarket that sells 300 different wines and cheeses at a fraction of the price you would pay at home is a revelation but you can only enjoy it if you allow the time to do so. Making a “U” turn in a motorhome is never as easy as it is in a car. Allowing time in your schedule to make mistakes is essential for stress free motorhome travel. Getting a bit lost can actually be fun if you are not under pressure to be somewhere else. Taking a wrong turn and finding yourself in a 15th century French village, well off the beaten track is not a bad way to lose a few hours. 6. How many kilometres should you aim to travel in one week? Don’t do it! It won’t be fun: Anything over 1500 kms per week. Remember, every 60 to 100 kilometres of distance you spend driving a motorhome will deprive you of approximately one hour of doing something more fun. Most people want to see and do new, interesting things and above all relax during their trip. You cannot do this if you are trying to cover big distances as all you will see is campsites and fast roads instead of the charming things that lay around every corner waiting to be explored. Motorhome travel is suitable for just about any kind of itinerary with the exception of trips that exclusively visit big cities. If your plan is to see Paris, Bruges, Amsterdam, Bordeaux, Nice, Rome and Barcelona without stopping to see anything in between, a motorhome is the wrong choice. It’s nice to see the odd city for a change of pace but if all you want to see is big cities with lots of kilometres in between each, our advice is to fly and use hotels. Big city visits are usually enjoyed and appreciated by our clients but never seem to be the highlight of any holiday. It’s the unexpected encounter that always seem to rank as the best experience of a motorhome trip; Parking overnight in the grounds of a chateau vineyard at the invitation of the winemaker, stumbling across a pretty town with a music festival in full swing, tasting a great cheese with the man who made it, seeing spectacular views and wildlife in the mountains, canoeing down the river in a famous gorge. If you try and go too far you will probably sustain some damage. We know this for a fact. Doing anything with a motorhome in a hurry is a bad idea. Preparing your vehicle for travel, parking, reversing or just driving along a narrow road needs to be done with patience and care. The faster you try and do these things in a motorhome, the more likely you are to break things or have an accident. Driving longer distances increases the risk of accidents due to fatigue too and if you stop long after your passengers were ready to, their discontent will just add to the pressure when getting parked up and you’ll make mistakes. There will always be challenging situations when driving abroad so how you handle them and avoid damage is very much up to you. Going too fast to allow room for the aggressive truck driver coming the other way will result in you losing an expensive wing mirror at best. Driving when tired will mean you are less likely to spot that low bridge, anticipate stopping distances or patiently work your way down a narrow street. Your state of mind will have big impact on how you face adversity from heavy traffic to impatient fellow road users. It is you who will be threading a large, unfamiliar vehicle through historic roads and ever changing conditions. How would you rather do that? Refreshed calm and alert or tired, ratty and under pressure because you have driven too far? Having examined this in great detail with data from our own records, we know there is a direct correlation between travelling big distances and sustaining damage. Have you ever spent a week travelling and not encountered a single delay? Nor have we and we have been exploring Europe for 25 years, speak French and are very familiar with the workings of a motorhome. As a rookie motorhome traveller or newcomer to France, you will experience delays during your trip. The pace of life here and quirky opening hours pretty much guarantee it. On any road trip, even if travelling by car and staying in hotels, there are good delays like an unexpected event that you decide to stay on for but there are also bad ones like traffic jams or a punctured tyre. When you are also living in your mode of transport, even more things can interrupt your travel plan such as the campsite not opening until an hour after you planned to leave or having to make an unplanned detour to find somewhere to top up your water tank. Most people underestimate how long every journey will take and finish up driving for longer than they had intended. Add unexpected delays into the mix and your journey can quickly turn from pleasure to chore. Anticipate the inevitable delays and take them in your stride – they are going to happen and how you prepare for them will dictate how you feel about them. Allow time for them and you will maintain your good holiday mood. Leave no slack in your schedule and delays can really ruin your trip. What is the most difficult part of any holiday with kids? That’s right, the journey. Unless you are travelling by elephant or space ship, children are generally not enthralled by journeys so when planning a motorhome trip with children it is particularly important not to spend all day or even every day driving. Motorhome travel is better than car travel as they will at least have a table in front of them and huge windows to look out of. However, devices, reading, colouring books and eye spy will only distract them for a short time so plan your trip accordingly and aim to be parked up for most of it so the kids can be running off steam outdoors rather than strapped into a vehicle. Calculating distances and driving times before you leave home can be difficult if you are not familiar with driving in France or Europe but you can create an initial itinerary then look at it on Google Maps to see the distances involved. It will also show you approximate driving times for a car (you should add 25% to the time to get a good idea of how long it will take in a motorhome on European roads). Having decided it looks achievable, try having a bit of a destination cull and you will arrive at a much better plan. How many times have you had to reduce what you fit in when packing your suitcase? Did you still take too much stuff even after the cull and did you miss anything you left behind? Probably not and you won’t miss the things you leave out of a motorhome trip either. Plan your trip with this approach and you can always decide to fit in more if you are ahead of target and the pace feels too slow. Deciding to go to too many places before you come then not being able to fit it in comfortably can lead to disappointment. Don’t forget to add time for sightseeing, that is after all what you are coming to do! Once here, keep an open mind and have a daily sanity check. Talk to your passengers and find out if everyone is actually enjoying the trip you planned from your kitchen back home or is it a bit too frantic? A good road Atlas is an essential tool to have with you and buying one before you come will help when planning your trip. Even with online maps or GPS to find your way, it is difficult to plan the best route if you only know the name of your destination and have no overview of the areas in between start and finish points. Just because your initial idea was to fit in a huge list of destinations does not mean you have to carry out that plan and persevere with an overly challenging itinerary. In a motorhome, your accommodation and mode of transport will go wherever you go with no need to commit to any particular destination so you can re-plot your route before or during your trip at any time. Great trips are about the sights you see, the people you meet, the welcome you enjoy from local people and the camaraderie with other travellers. Those elements will be the same if you travel 20 kilometres or 200 kilometres per day so setting your schedule should be about achieving the best holiday for you and returning home as relaxed as possible rather than trying to drive the furthest distance you can. Those who take time to explore and travel at a gentle pace have wonderful trips that are memorable for all the right reasons and return singing the praises of this beautiful country and the French people. Those who try and rush through it at break neck pace always return complaining there is nothing to see here which is hardly surprising as they have spent most of their trip on the autoroutes! Europe, and particularly France should be savoured and sipped not consumed in great gulps!